Live Life Like a Best Seller: It's the Little Things . . .
. . . That Make All the Difference in the World. We are so blessed to call Subotica, Serbia home. Of course there is a language barrier, and sure, we miss some of the comforts from home, but there is so much to be grateful for. And we have realized how LITTLE we need to be happy. Nothing is impossible when you truly invest and love where you have been placed. - Waking up with Chris every morning, sharing breakfast, packing his lunch, and sending him on his way with a kiss and a wish to "have a beautiful day and get home to see me soon!" - The first cappuccino of every day. - Beginning to recognize familiar faces as they pass on the street. - When waiters bring me a glass of water before I even ask. - Being invited to a stranger's birthday dinner. - Finding paining canvas at the overwhelming "China-man-store." - Playing Settlers of Catan with Chris, Marko and Lela . . . and Lela wins! - Free coffee just to say "welcome to Serbia." - Skype dates with family and friends that make home feel a little closer. - The enormous, outdoor fresh market that has become one of my favorite places! - My elderly neighbor (who does not speak English)cheerfully saying hello to me every morning. - Running into three American travelers who were researching their heritage in Serbia and Romania. - Being invited to a dance rehearsal - simply to watch, enjoy and smile. - Discovering P90X and Insanity on my hard-drive. - Fresh popcorn for .30 cents on every street corner. - Five sweet, retired men at the same cafe (with me) every morning. 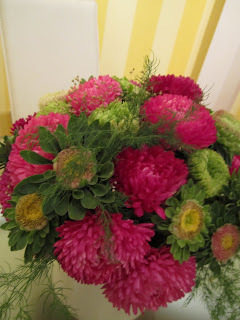 - Gorgeous and cheap flowers to brighten up my home. - Finding a park with running trails. - A soccer game with Marko, Lela, Darko, Zoran and Slaga. - The bakery (pekera in Serbian) that I visit every morning for a fresh loaf of bread and a shy smile. - Finding a hotel nearby with a pool that we can use. 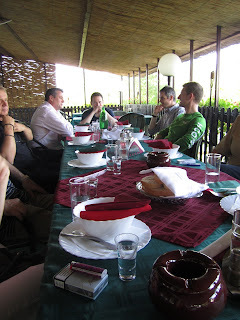 - Visiting with one of Chris' managers from the States over a traditional Serbian feast. - Warm weather, no allergies, no bugs, and patio seating. - The grocery store in my apartment building. - Not having a cell phone - I know it is about time, but the silence has been sort of peaceful. - Laughing children in the park next to Plato Books. - Overhearing conversations in Serbian and understanding a few words here and there. - Ordering what I want at a restaurant - in Serbian. - Meeting a retired English teacher and being invited to volunteer with her to teach other elderly women English. I love that they still are so eager to learn. - Dessert for lunch with Aleksandra. - Southland Christian Church podcasts. - The way that Chris adores American football.
. . . . . Just to list a few of the little blessings, and there are so many more! We have also experienced a few huge blessings, and times when we really sensed that we are in the right place at the right time. I will write about all that next week. We have a full weekend planned so I won't have time to write over the weekend! Yeah for plans! I love this blog! and I am so happy that your beginning Serbian experiences are so joyous. You may also find a real non-Orthodox church nearby. Though they are hard to come by. I really hope you are still there when I return to Serbia. I Love people who chose to be happy! and you are one! I agree with the Southland Church podcasts! They make me feel I have a little piece of home! I found a new one. . I love "kikiriki" (peanuts in Serbian). Every time I see them in the grocery store, I giggle. All of my Serbian friends know that if they utter the word, I will burst into laughter. What a great word, eh? !